We all hoard stuff. Yes, even you. We all hoard to a certain degree. That’s “hoard” with a lower-case h. I’m not talking about Hoarding Disorder (another post, another day!). I have a friend who has a well-organised, substantial hoard of travel toiletries. I have more staples than I’ll use in the next 5 years. And I have amassed quite a collection of iPhone cables. We do our hoarding either passively or actively. If we actively hoard, we are aware of the volume of stuff we have, and we continue to acquire them and choose to not discard any (shoes, notebooks, pets, furniture, craft supplies and books come to mind). 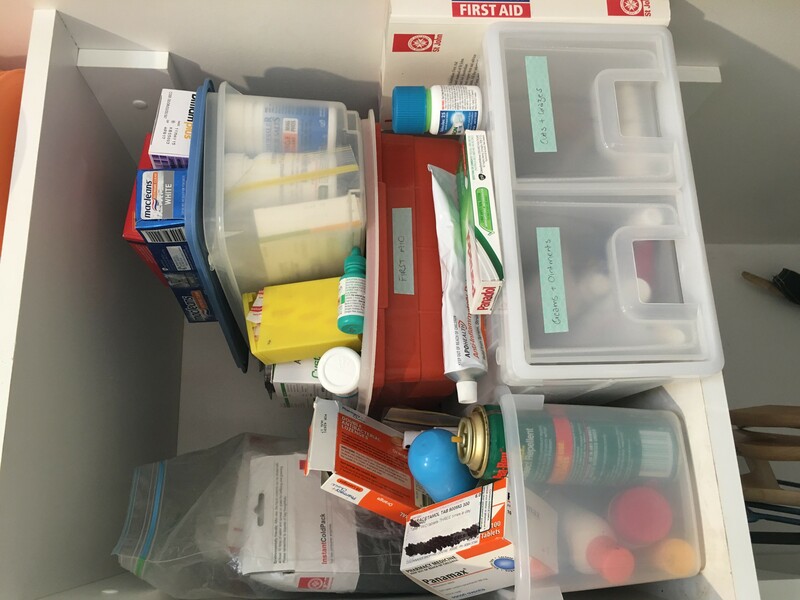 When we passively hoard, we accumulate relatively mindlessly (as part of everyday life) and don’t have the corresponding habit of discarding established. And so we gather a little collection without realising. My friend recently went through her junk drawers and found several boxes of staples and no stapler. I think they’d also accumulated several rolls of tape. She was surprised – she had no idea they had that many. That’s passive hoarding and you’ll see it manifesting in things like pens, tape, broken things you intend to fix, cassette tapes and VHS tapes, cords and cables, placemats, old paperwork, coffee mugs, plasticware, water bottles, stubbie-holders, vases and platters. You don’t realise until you go to declutter just how much you’ve accidentally kept! If you’re passively hoarding stuff, it’s a good idea to establish the habit of regularly going through those areas and having a quick cull to keep the volume at bay. Another good habit is to have a quick review whenever you bring a new item into the house and see if anything needs to go to make room for it or to maintain the current volume. What do you find that you passively hoard? Many people who struggle with clutter have difficulty “de-owning” their stuff. They get anxious at the thought of parting with it because all the fears crowd their mind with a billion “What if..?” scenarios. If you are one of those, you’ll be pleased to know that your first goal is not to part with items. Your first goal is to reduce your anxiety around letting go. It’s not about the item, it’s about the discomfort. It doesn’t matter WHY you want to keep it, it’s about anxiety itself. If you can expose yourself every single day to the behaviour of letting go (starting with really easy things) then your brain starts to back off. You will realise that your anxiety isn’t as high anymore. Initially, for the first thing you let go of, it will hurt. You’ll feel very anxious. Don’t give up – the pain doesn’t last as long as you’re anticipating. The next one will hurt too, but the one after, and the one after that will all hurt less. This is proven. You’ve built up your “letting go” muscles and the workout won’t hurt as much anymore. Be careful – if you cave to the pressure and practice the avoidance behaviour (the keeping) instead of the behaviour you’re trying to encourage (the letting go), it reinforces your brain and takes you straight back to the beginning. A psychologist once told me that if you give in just one time, it will undo a fortnight’s worth of letting go practice. That’s why it’s important to focus on an easy category of items – so that you are more capable of pushing through the anxiety. After you’re no longer uncomfortable with one category, you can work your way up the line to the harder ones. Consistency is the key – if you don’t do it EVERY SINGLE DAY you’ll be wasting your time because your brain will revert very quickly and you’ll undo all your good work. 1. They acquire mindfully; only buying something if they know they need it and have identified a specific use for it. They happily pay full price because they know it’s of value to them (unless they find it’s conveniently on sale when they go to buy it) and avoid sales and being enticed by discounts. They only acquire something if they know where they’re going to put it, and that it fits there easily. 2. They have hobbies that either don’t require a lot of stuff, they set boundaries around how much of the hobby stuff they can have, or they limit their hobbies to a small number (like one or two). Or all of the above! They are satisfied without trying to do everything all at once. 3. They are okay with letting things go. They put themselves first and don’t keep things out of guilt or obligation. They don’t take everyone else’s problems on as their own. They have their emotional needs met by a small selection of sentimental possessions only, rather than keeping them all. 4. They don’t have a fear of missing out. They know that they’re always missing out on something, so why fight it? They are comfortable in the knowledge that they can’t have and do everything, and that if they tried, it wouldn’t result in happiness. 5. They base their self-worth around things other than their belongings. They know that even without all their stuff, they’ll still be okay. Their happiness does not depend on having things. They trust that if culling something means one day forgetting something, that they’ll still be okay. They trust that even if they one day regret culling something, they’ll still be okay. Perhaps you can see ways you might be able to create some clutter-free habits, too? My husband and I have two children, aged 11 and 12. We have always, from a young age, encouraged independence in their day-to-day lives. We try to be firm and set boundaries, but without being dictators about it. When it comes to chores, we have faced a similar issue to other parents – how do we encourage them to contribute to the household (picking up after themselves as well as extra stuff) without having to resort to bribes, rewards or punishments? Or worse, shouting, tears and slamming of doors? We don’t want to bribe them because I want them to want to do it (yes, I know, I don’t want to do it so why should they? But at the least I want them to want to help us). We don’t want to reward them because I don’t get $2 or a chocolate for making my own bed, and we want them to be generous and grateful for what they have and not be always expecting some sort of payment for everything they do. And we don’t want to punish them because we don’t believe in a punishment-based discipline system. So somewhere in all that muddle of trying reward charts (yes, went down that path, failed), checklists to be completed before pocket-money would be dished out (also failed), asking nicely 3759 times (for the most part that worked eventually but who has time for that?) and barking orders randomly (got stuff done but built resentment and we felt mean), we sort of fell into a system that is working well for us, so I thought I’d share it. We expect that a certain minimum standard of contribution be met. That minimum is a tidy (not spotless) room, with a made bed and (almost) everything in its home (we are somewhat relaxed because they often like to carry games and activities on for a few days so that is happily left strewn all around until it’s finished), and nothing that belongs to them hanging around the living areas and not in its home. That minimum needs to be done before we consider allowing privileges. Privileges are things like playing on screens and devices, watching TV, going to play with friends, heading to the park, going for a swim, having a friend over. Basically anything fun ;). So the minimum standard becomes a pre-requisite for having those privileges. In addition, there are sometimes jobs that also need to be complete before the privileges kick in. If the dishwasher needs emptying, if they have clean clothes to put away, if the table needs setting or clearing, if their bathroom is grotty, or even sometimes even if they need a shower (yeah, they’re still in that “But I showered YEESTERRRDAAAY” phase), then that also needs to be done before the privileges kick in. I was explaining this to my clients recently, with their 12 year-old present. Of course, she wasn’t overly excited. She didn’t like the idea of tidying her room daily (although she craved order and wanted to be helpful). Her dad explained it well. He said “You know how you can’t go to school until you change out of your PJs? Well, what we’re going to all do is the same – it’s just a pre-requisite, not a punishment”. Another analogy you can use with your kids is “going up a level”. It’s like a game – you can’t get to the next level until you complete the first. Since doing things this way, I have noticed quite a few positive outcomes. Secondly, I have less work to do around the house. Most of the detritus that clutters up our living area is kids’ stuff (what’s with all the SHOES? ), and when they clear it, Mick and I have little tidying of our own to do. Thirdly, they have less work to do each time. 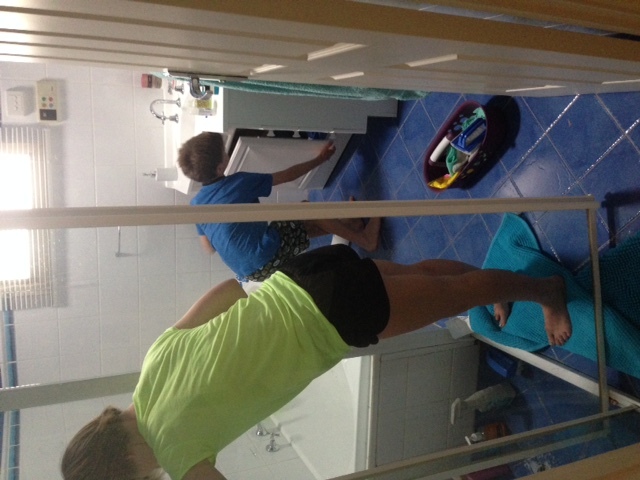 The more frequently they tidy their rooms (it’s at least daily), the quicker it takes. This is teaching them a valuable life lesson – small steps make for large benefits. Finally, I have to think about it less. I have to remind them less about their room and their “stuff” hanging around. It’s less mental work for Mick and I because it’s not in our heads. There are no charts to remember to fill out, no adding up, no negotiating. It just happens. My hope is that they will develop a habit of getting the minimum stuff done every day so they don’t have to remind themselves, they don’t have to think about it, and they don’t have to worry about it building up. I once told my daughter (when asked “Why?” during a complaint session) that it’s my job to raise kind, generous, and balanced adults. And this is part of it. I also hope to improve our son’s short-term memory. He would forget his head if it wasn’t attached to him (a genetic gift from yours truly) – hopefully by putting basic tasks into his reptilian brain (where our habits are) he’ll be more focused on “the now” and a little less forgetful. You know how I’m always on about how unproductive it is to multi-task, or to switch from task to task before they’ve been competed? I’m also a fan of working with your personality, so here’s something you can try if you really love the variety of multi-tasking but know it’s not getting stuff finished. Choose 2 or 3 jobs that you want to finish by the end of the day; no more than 3. Now, allow yourself to jump (as infrequently as you can manage) from task to task, but NEVER deviating from those original 3 projects. You should find you enjoy your day more AND get stuff done! This is such a common question I get that I can’t believe I haven’t written a blog post on it! There are several ways to deal with kids’ artwork, so I’ll give you a run-down of a method that works for me and I recommend to the majority of my clients. It might work for you, too. Firstly, have a place to put all the artwork when it comes in. You can put it on the wall, or in an artist’s folio sleeve, or both (the wall for a month, then the folio or a combination). 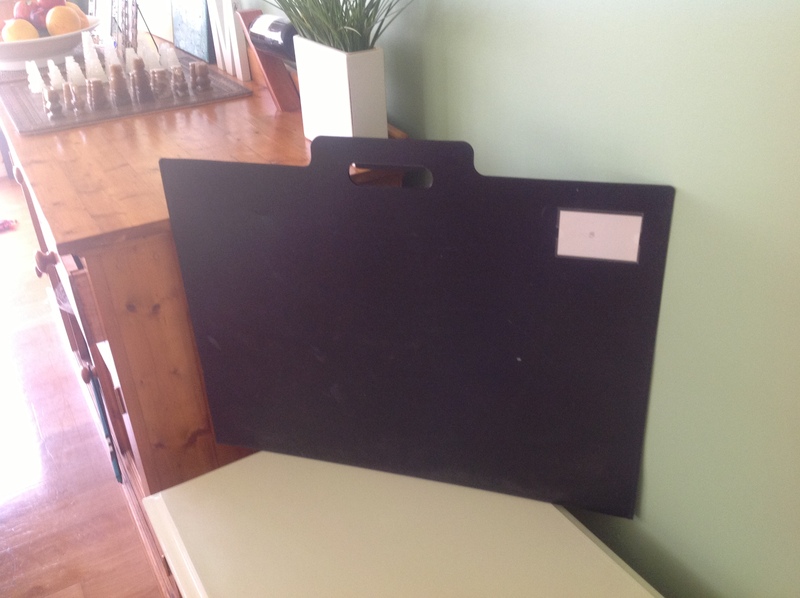 The folios are designed for one or two pieces of artwork but I’ve shoved 6 month’s worth in there fairly easily! Slide it behind a piece of furniture for safe-keeping. Ours goes behind our buffet. Create a routine in which you regularly (when they are little do it every season, when they are older you can do it twice a year or so), go through the folio and photograph or scan every picture. Have the children pick out a few originals to keep, then recycle the rest (or use it as wrapping paper, or give to family – whatever you like). The originals that my kids keep go in an A3 display book with plastic sleeves that they can look in any time they like, and is stored in their bedrooms (slid behind a bookcase). The really special ones get framed. If they are attached to their artwork this can take some coaxing, and you may get tears, but they do get used to it and if you can create a little slide show of all their artwork on the computer, you’ll win them over – they love it. You could even get a photobook printed of all their creations every couple of years. It’s important for children to learn that there is a finite amount of space that we live in, and we can’t keep everything. The alternative of having the photographs means you save space and you still keep the memories. 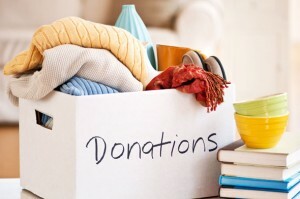 It’s a great clutter-controller to have one spot to put things you want to donate. Find a box that is a fair size (too small and you have to head to the charity place too frequently!) and create a home for it that’s fairly accessible, but not in your high-usage areas. I’d suggest the bottom of a laundry shelf, bottom of the linen closet or in the garage. Label it “To Be Donated” and teach the family to put anything in there that they no longer need, use or love in there so it can be loved by someone in need.Whenever it gets full, take a quick trip to the nearest charity and drop it off, replacing the box in its spot again to continue the cycle (don’t leave it in the car for 3 months!). Do you dread going into your bedroom? Is it piled high with clutter? Do you wake each morning staring at a mountain of things to do? A cluttered bedroom doesn’t encourage a loving relationship or healthy sleep! Try this 6-step process to declutter your room so you can reclaim your haven. Decide on your vision for the room. 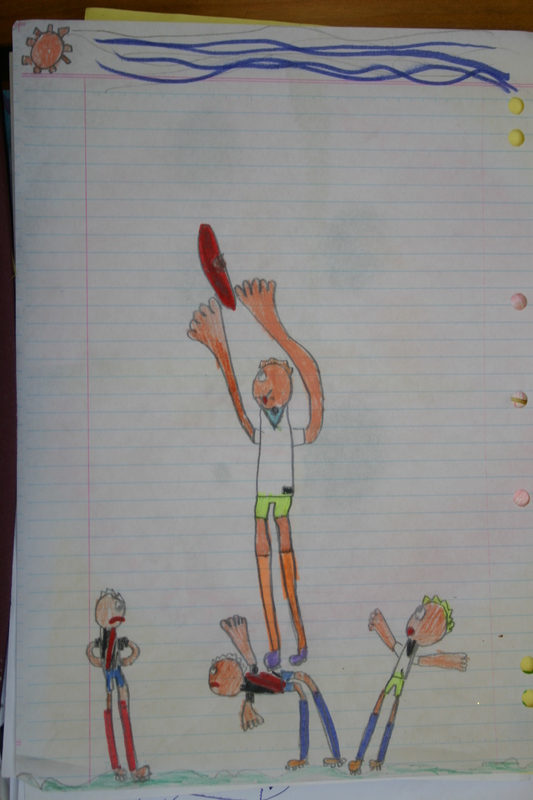 Write it down, draw it, close your eyes and ‘see’ it. Eliminate all items that don’t fit the vision. This includes paperwork, kids’ toys, excess books and magazines (keep just a few for current reading) and homeless “junk room” stuff that belongs elsewhere in the house. Group everything that remains into ‘like’ groups – clothes with clothes, shoes with shoes, jewellery with jewellery etc.. Eliminate duplicates and anything you no longer need, use or love. Eliminate any clothes you put on but always take off again, that are damaged, do not fit or you just don’t like them anymore. You can donate or sell items; it’s your choice (only sell if you have the time and really need the money – otherwise it’s just another thing on your list of things to do). This is the hardest part – letting go. Yes, it’s difficult, but keep your vision in mind and you’ll be able to do it. You NEED a restful haven to sleep in. Find and create homes for all the items you need, use and love. 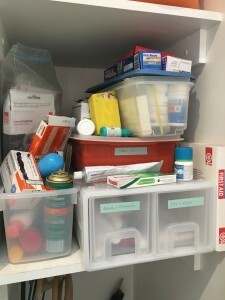 Remember that those things you use frequently should be easy to get to, and those that you use infrequently (like luggage, memorabilia and spare linen) should be less accessible – use the high and deep spaces for those items. Don’t forget the useful space under your bed, too. Use vacuum packs, tubs, drawer dividers, clear shoe boxes, jewellery organisers and other useful organising tools. Don’t buy them until you know where they are going and what is going in them, though! 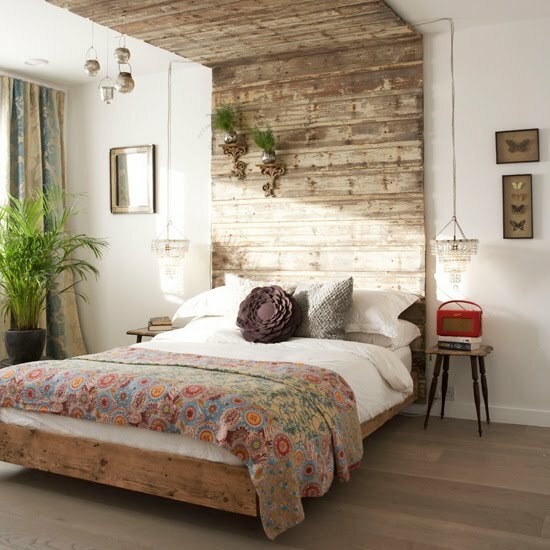 Set up a new habit of ‘resetting’ your room before you go to bed each night – all that is required is that you do step 2 really, and then for everything that’s left, put it in its home. And then enjoy a peaceful sleep. I know many people will say “It’s not as easy as that”. But I do this every week with clients and it IS that easy – I know from experience. You just have to let go of the fear. You’re brave, I know you can do it! Going back to school after the summer holidays brings mixed feelings. Personally, I’m sad to see the holiday feeling leave us – I love the holidays. However, many kids are ready to get back into routine, and quite often their parents are more than keen for that, too! Here are some tips for kicking off the year in an organised manner. Reinstate (or introduce) a morning routine. We keep ours during the holidays, but have a more relaxed version. If we didn’t keep it, I’m sure the kids would never clean their teeth! The morning routine should hand responsibility of their own self-care over to your children, encouraging their independence and easing your mental and physical workload. Similarly, ensure you have an after-school routine in place, even if it’s as simple as putting their bag in its home and handing over empty lunch boxes and any notices from school. Make sure they are getting enough sleep. If your family is anything like mine, they’re often in the pool until 9pm at night during the holidays. This works just fine because we let them sleep in to compensate. Once school starts, however, our kids need at least 10 hours of sleep a night to function at their best, and because they have to get up early to go to school, a 10pm bedtime is a bit late to squeeze all those hours in! Ensure they get back into the routine of a healthy bed time as soon as possible (depending on your child, you may need a week or more of transition – ours cope okay with a couple of days). Set up a system for organising your paperwork so that the school notices don’t get lost or forgotten. There’s nothing like having your child turn up for school in uniform and everyone else is dressed up as a pirate. Your child will take some time to forgive you that little slip-up! Have a home for bags, sports uniforms, shoes, hats, sunscreen and library books, and help reinforce the habit of keeping them in their homes. You’ll need to issue lots of reminders before it becomes second-nature to them, but it does happen. Introduce Menu Planning into your own routine. It will help ensure you never run out of bread and have to resort to buying lunches. It will save a lot of money and reduce morning stress. What are your own tips for making Back-to-school time organised and stress-free? It’s New Year’s Day, a time that many of us decide we will make some resolutions to change for the better, and that 2012 is going to be better than 2011. More money, more friends, less stress, less fat, more fat, more joy, more holidays, less travelling, more clothes, less clothes, more stuff, less stuff, new car, new house, new partner …*takes deep breath*… new friends, no more new friends, more muscles, less crying, better parenting, better job, no job, see family more, see family less, help more people, get help more often, quit smoking, drink less, eat more meat, eat less meat … the list goes on! Most people want to improve themselves or their lives to some degree; we’re all alike in that way. 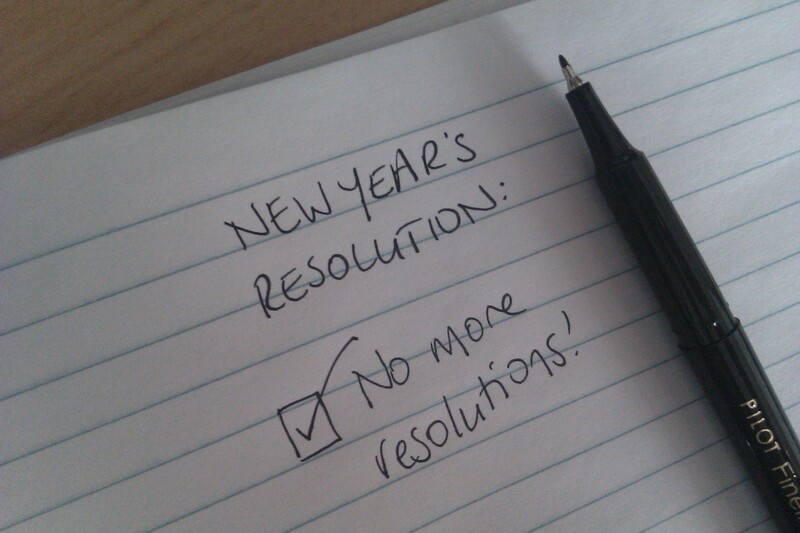 Most New Year’s Resolutions fail (I won’t go into detail, but there are stats supporting that sweeping statement!). So I recommend that you just don’t make any. But no, you cry, how will I improve if I don’t make a resolution to? Easy – you take action. A resolution is just a decision to do something, and decisions don’t get you anywhere. To change, you need a goal, some determination and action. Action is what gets you over the line! Choose a theme (“financial freedom” “healthy living” “learning journey”). You can’t change everything – it just doesn’t work. Pick a theme for 2012 and base your goals around it. Don’t stress, though; if you want to lose weight AND learn French this year, that’s fine! Restrict your goals to only a few (maybe 3?). Brainstorm a list then trim it down to the most important ones to you. Keep the rest to review next year. DON’T give up altogether if you stumble. Just start again! Perseverance is the key. Share your theme for the year with us – what are you focusing on? (In case you were wondering, mine is “Acceptance” – rolling with the punches, flowing with the current and being grateful for all I have). Future You and Past You – are you ignoring them?